I don't know if I mentioned this on my blog before, but last September the San Francisco School of Needlework and Design issued a challenge along with Swarovski Crystals to create a piece of work with an undersea theme using a generously donated baggie of crystals from Swarovski. I applied and no one was more surprised than I was that they accepted me. There were many entries (no prizes were at stake...just the fun of making something) and over the weekend the School posted an online show of all the entries received from around the world. If you'd like to see them have a look HERE (be sure to keep clicking the 'more' feature at the bottom in order to see them all). Tomorrow I will try to show you more pictures of my design. 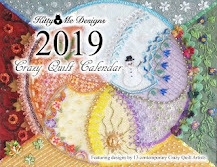 I have to say that I am very excited to have taken part in this challenge - it stretched my design capabilities in a direction I hadn't gone before. The School is currently taking applications for their next design challenge called 'Summer of Love' and you can find out more about that HERE. Sharon Boggon, is now available! or HERE to order through Etsy!! about my School design too!). 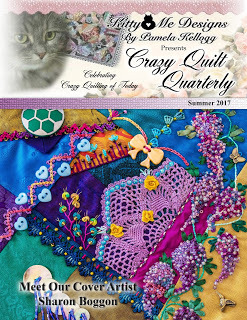 The team at 'Crazy Quilt Quarterly' are always searching for your photos, your articles, how to's and anything you feel that would suit the crazy quilting theme for the magazine. Please do submit your photos and articles to either Pam (or to me if you're shy!). The magazine is only as good as you help us make it and we love to see what you've created! Right now Pam is particularly looking for things for the Winter/Christmas issue but we're happy to see anything that you're working on. - If you have a toddler in your life, perhaps you might like to knit THIS. Don't know of too many little boys that wouldn't be enamored over this one (and no doubt lots of girls too!). - THIS is a pretty crocheted sweater pattern. - If you like garlands, perhaps you might like to make one of THESE. 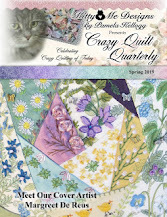 - Judy Cooper has added a number of really great links to THIS post concerning landscape quilting. Well worth checking them out! Today your quote is from Charles Dickens...."Spring is the time of year when it is summer in the sun and winter in the shade"
Your work on this block is gorgeous! And your piece with the "Jewels of the Sea" is one of my favorites. You do such beautiful work! Your block 6 is beautiful. So delicately stitched on the perfect fabrics. I always love to see your use of sequins and buttons. The piece you submitted to the challenge is not like anything I have seen you do before. So cool. I have to admit the Sardine can art really blew me away. I saw some names that were familiar to me, but had not heard they were participating. The block is simply beautiful! Congrats on submitting your piece for Jewels of the Sea - very clever girl! Loved looking at all the entries to the challenge. So many different interpretations. Well done being accepted for the Jewels of the Sea. I enjoyed watching it's growth and the final photo and many others have also.